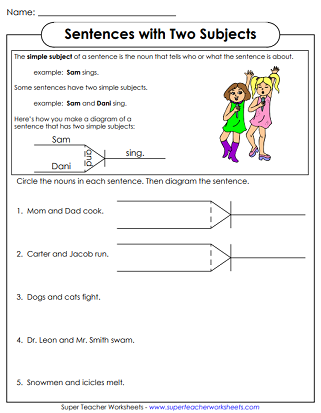 Learn to diagram sentences with these grammar worksheets. These sentences have only two words- a noun and a verb. Create a diagram by separating the subject from the predicate. Diagram these sentences. Each one has double subjects, a conjunction, and an action verb. These simple sentences each contain one noun and a double predicate with two action verbs. These sentences contain two simple subjects and two simple predicates. Practice diagramming these sentences. Diagram the sentences. Each statement has one or two nouns and one or two verbs. Each statement on this page contains one or more adjectives and/or articles. Identify the verbs and adverbs, then make a diagram. Diagram these basic sentences with nouns (simple subjects), verbs (simple predicates), adverbs, and adjectives. These sentences have adjectives, adverbs, or both. Draw a diagram of each sentence. Direct Objects are nouns in the predicate that receive the action of verbs. Identify the direct objects and try diagramming the sentences. Linking verbs connect a subject to its predicate. Common linking verbs include be, am, is, are, was, were, been, smell, look, taste, feel, and sound. 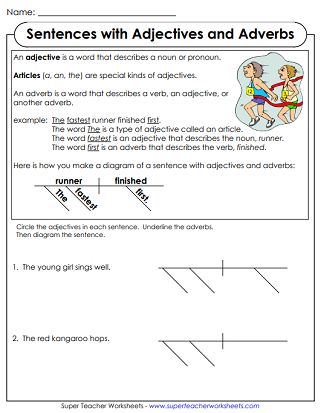 This diagramming worksheet is tricky because it contains a mix of adjectives, adverbs, and direct objects. Learn about subjects and predicates, nouns, verbs, pronouns,adjectives, and adverbs with our huge collection of grammar printables. 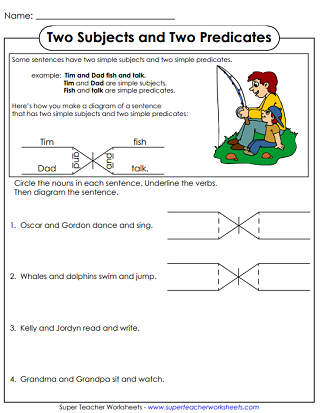 Teach phonics, grammar, reading, and writing with our English-Language Arts printable resources.